It’s been a busy few weeks of planting, weeding, and harvesting at the farm. With the ongoing good weather, things have been growing like crazy. Getting plants going on the farm is an ongoing process. 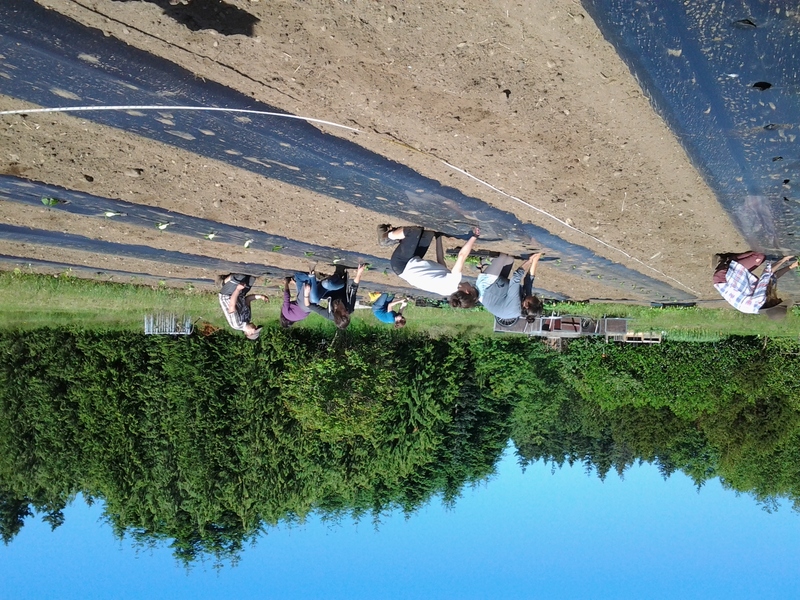 Sequences of salad mix greens and brassicas continue to be planted, to ensure an ongoing harvest. 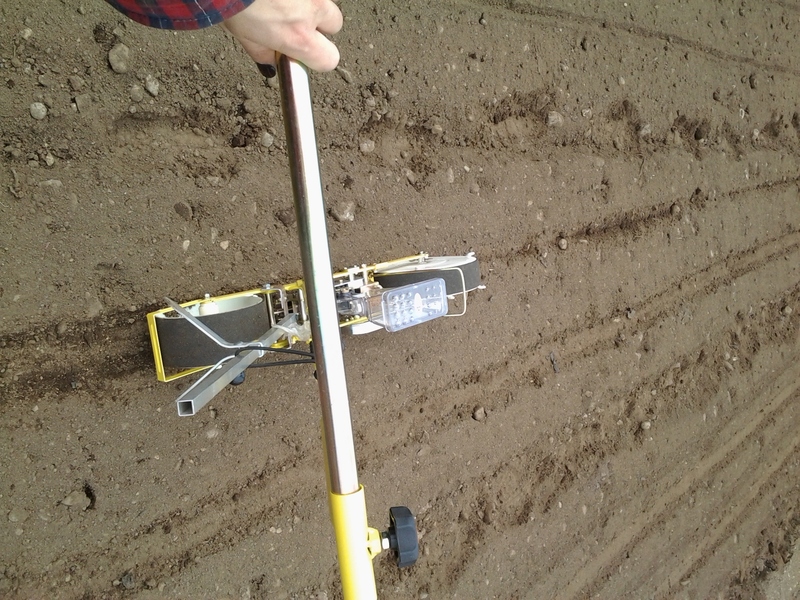 I was able to get to use the JP Hand Seeder to plant arugula and radishes, quick growing spring crops. The seeder is a tool that greatly speeds up planting, and helps ensure even spacing, cutting out thinning time later, and straighter lines, for easier weeding and harvest. We also spent a few hours putting squash and cucumber transplants into the ground, poking holes in black bio-plastic mulch, which protects the plant from excessive weed growth, keeps the soil warmer while retaining water, and makes it so that the fruit won’t sit directly on the ground, which can lead to rotting. With a small army of 10 practicum students to do these kind of transplanting tasks, we get the job done relatively quickly (although my planting speed is less than half that of the experienced farmers), and it often makes me wonder – how does a small-scale, 2 person organic farm get things done? With greenhouse tomato plants getting to about 3 feet tall, we spent sometime pruning off the suckers. When a tomato vine grows on a farm, we want it to grow with just one, maybe two, main stems, in order to concentrate the plant’s energy into fruit production, as well as keep the vine in control, so each new stem must be cut off. We learned to identify each new sucker – the new stem with multiple leaves, growing in the crotch of the main stem and a single-leaf branch. 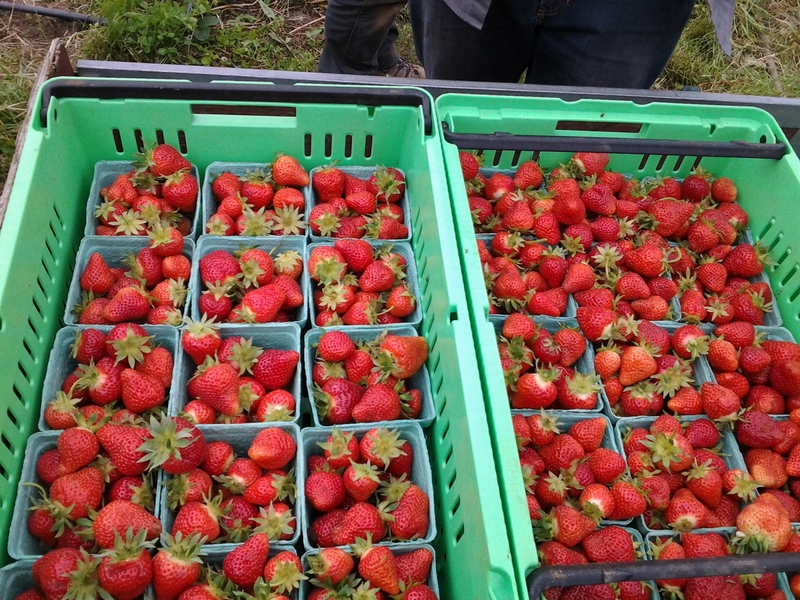 The exciting moments came with the harvesting – strawberries! Plucking the ripe red berries from the low bushes, with just a couple samples (it’s a tough job, but someone needs to make sure they taste good), is a sure sign of summer. Although not the farm’s first harvest, the strawberries are the first harvest I’ve participated in this year, and it’s very exciting, signalling a change from season preparation into the long days of harvest and market. 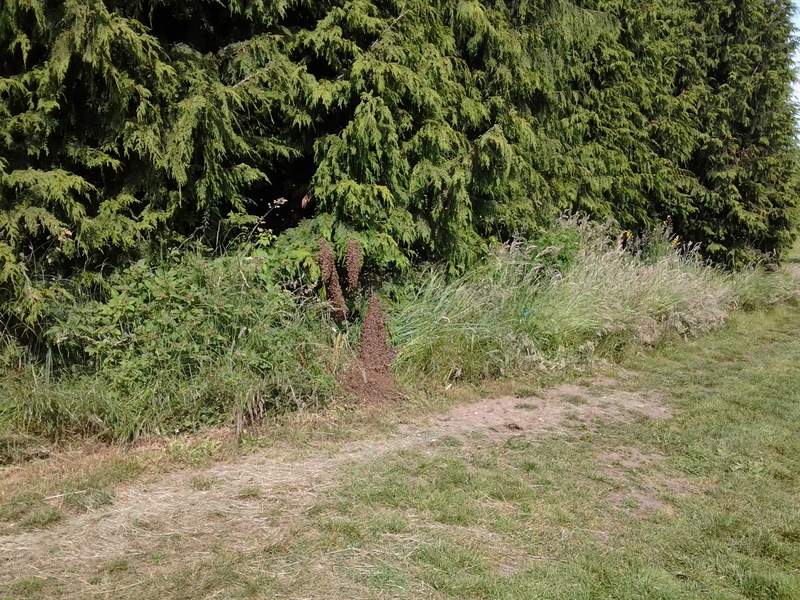 The other day, on our way back from the field, we saw a massive swarm of bees not far from the hives. For a while, they flew all around in a huge swarm, but then settled into a mass of bees along the ground and a few low branches of a nearby tree. Relatively harmless, the hive had produced a second Queen, and the first had stopped laying, making herself small enough to fly, as I learned from the beekeeper who arrived a while later. Taking off, about 30-50% of the hive follows her in search of a new home. 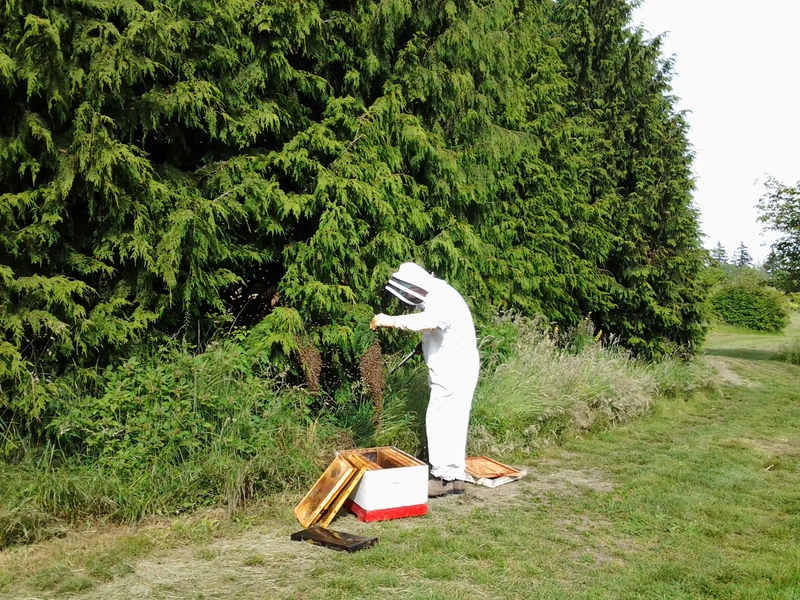 When the beekeeper arrived with a new hive for them, with honey in it to smell like home, he gently clipped the branches the bees had settled on, and placed them in the hive, where eventually the other bees followed. Overall, a pretty exciting afternoon.